Gabriela J. Garbacz’s new book, “Soul Wisdom: Conversations with Beings of Light and Love” (published by Balboa Press AU), shares Garbacz’s channeled conversations designed to encourage people to rediscover their identities, feel love and embrace a connection with themselves and the universe. 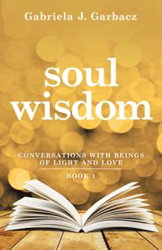 The book is available for purchase at: https://www.amazon.com/Soul-Wisdom-Conversations-Beings-Light/dp/1504312678. Garbacz describes “Soul Wisdom” as a collection of inspirational exchanges Garbacz had with star beings, ascended masters and archangels, such as Merlin, Jesus, Lakshmi, Kwan Yin and Joan of Arc. Garbacz maintains these exchanges offer guidance from a highly evolved perspective on how to navigate life not from the mind, but from a soul perspective, which leads to peace, love and compassion. Gabriela J. Garbacz describes herself as a healer who, for over 20 years, has been guided by spirit to explore the mind, body and spirit connection. After an intense awakening experience, she received the sacred gift of healing through sound, and now uses higher dimensional frequencies to bring about healing, alignment, realization, and transformation. Garbacz resides in Melbourne, Australia.